"I am onboard." Gringrin said. "Losing my good friend Randolf is a blow. But I am glad to travel with others that knew him." "I know Lady Isolde may not have made the best impression. But Marie was a fine girl and I know she will rest better if we can find her mistress." "I'm gonna miss traveling with you Josef, I'm sure you'll miss all the fun we've brought." "It certainly hasn't been boring my boy, I'll give you that," Josef chuckles between swigs of small beer. "But I think you're right, the faster we can get away from any of those strange fellows who seem to be following you, the better." "Who is following you all?" Grimgrin asked. "Ey be amazed at ow much u can eat." "I could say the same about 'ow much you mountain folk drink!" Paulus jibes back. "That's the problem," Paulus mumbles around a mouthful of bread and jam. "We don't know." Paulus takes a long drink from his tankard to wash his food down before adding, "They seem to 'ave a real interest in Connor though... or that Kastor fellow 'e resembles so closely." This message was last edited by the player at 07:25, Sat 10 Sept 2011. Grimgrin nodded and listened and then replied with a shrug "Well it may seem obvious but why not change da way you look. Most likely they would see frough it if you don't figure some distraction that makes them fink the fellow they have been following left de others and headed off on his own." 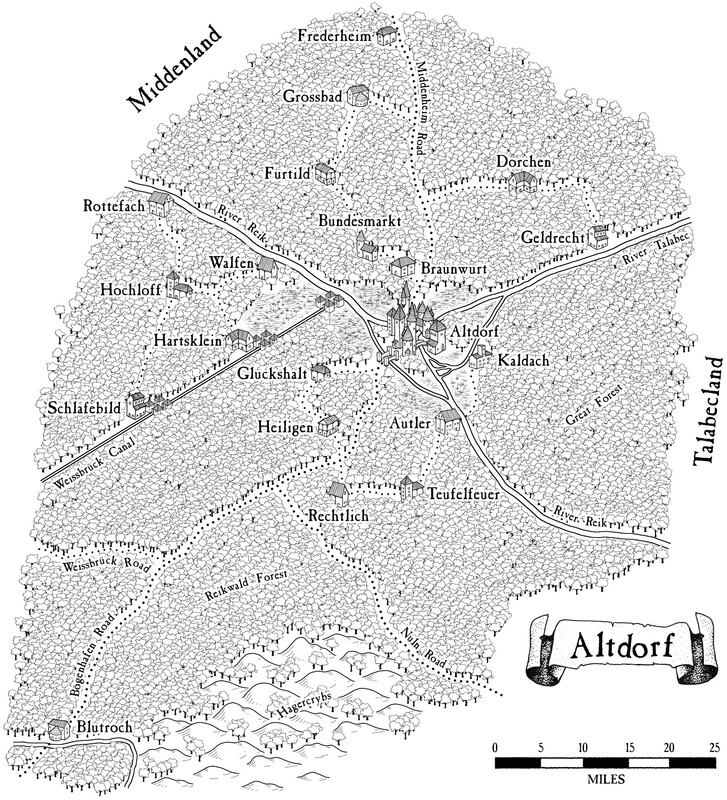 "I think we should avoid Altdorf, and just go to Kemperbad. Adolphus was in Atldorf. I'm not looking for a repeat. It's obvious someone wants me, and I don't want them." He said looking concerned. Two rainy days of sailing follow and the skies are still an overcast leaden color this afternoon as a fine misting of rain falls slowly from the sky. The 'Incognito' floats gently down the Weissbruck canal towards Altdorf. On either side of the river are the dense and dark Reikland forests. In just a few hours you'll be in sight of the capital and all it's glorious (and miserable) sights once more. But something is amiss... on the left hand side of the river is a tow path for vessels and barges that are partially pulled by animal power. The dim form of two riders can occasionally be glimpsed through the precipitation and fog. Something about the way they seem to stiffen when you look at them for too long and then drop back a ways gives you the distinct impression that they may be following you. This message was last edited by the GM at 07:15, Mon 12 Sept 2011. Ity was difficult to say goodbye to his friend Josef but Svlad knew their paths would cross aqain and makes sure that he is properly thanked before splitting up their band. Once Altdorf is in sight Svlad calls on hands on deck. "So what now crew? Do we continue on our way or venture into Altdorf to try and sell our cargo?" Connor straightened from where he had been leaning against the railing watching their followers. "Will this never end?" He turned to Svlad. "I've already to put my opinion forth, straight to Kemperbad. If we travel far enough, maybe those two will fall behind. I'm tempted to start putting arrows in their direction, just to try to startle them off." Being a crew member had been much harder than first anticipated but after a full day of hard work they had gotten a decent hang of it.Ulrich doubted they were ready for the high seas but rivers shouldnt be a big issue anymore. "Easy now Connor. I understand your resistance to Altdorf but lets not jump to conclusions and kill everyone we meet. Get your weapons ready though, stay in cover and pretend to be working. Svlad, continue at the helm. Paulus, Imrak. Keep an eye on the opposite bank. Ill keep an eye on these two. Ulrich said. Grimgrin had no received no orders but from his spot up near the boat his eyes stayed on the two men as they followed along. Once he is back on the boat, he will procure the Chain armor that was left behind from the previous occupants. Since no one had claimed them.. ...Following us... why is there always somebody following us... why aren't we following these people... Otto gestures to Ulrich and speaks to him in a lower tone..."next time we run into one of these...people. Why don't we take them down and interrogate them?" "We should. If we can get one alive." Ulrich whispers back to Otto. After passing through the final locks of the Weissbruck canal and rejoining the River Reik, the signs of Altdorf's approach become apparent. More and more garbage and discarded refuse begins to clog the waters and when the wind blows just right, you can catch a whiff of the capital's odor. Today it seems to be a combination of fishey dockside smells and the stink of a well used outhouse. Through the drizzle of rain you can see the point where the River Reik branches before reaching Altdorf. To the left is the main body of the river, flowing straight through the capital. To the right is the arm of the Reik that skirts around Altdorf to the south and west before rejoining the main body of the river to the southeast near the village of Autler. There has been no sign of the riders that appeared to be trailing you since you passed into the Reik. It will be getting dark soon but you could feasibly avoid Altdorf and dock in Autler for the night. Sailing the river in the dark isn't safe. "Gentlemen, I suggest we do a quick stop for a few hours and resupply in Altdorf. Connor, you should stay on the boat and maybe one or two of us should stay with him. I would like to hear some more about the murder of Ostland heir." "Sounds alright. I hit a dead end in the last spot. I still have the one tip to follow up on but I reckon I should check in with the watch captain to see if he has turned anything else up." Grimgrin said. But he also wanted a chance to visit Morr's Garden and see that Marie was properly interned and offer some prayers. He did not hold much with most manling Gods but Morr was one you did not wish to ignore. "Oh yes my lord, I would love to stay on the boat. Perfectly content to stay here while you visit one of the Empire's big cities." Connor says sarcastically, before stalking off to a different area of the boat. "Aye, aye. I'm taking her in. I'll stay with ther lad. There's lots to do aboard if yee are to go a shore. And make sure you see about getting rid of our cargo. Or at least price it...if it is too low we'll take it down river with us. We'll need a list of supplies done up too..."
Otto follows his friend. "I'll stay with Conner." "What was done with Randulf's body? Did you take him to the House of Morr?" The dwarf asked. If so he planned on dropping some coin so a few prayers could be said for his friend. "He was buried in Bogenhafen. Proper rights and everything." Ulrich answers the dwarf as he rolls his eyes and chuckles at Connor. "Thank you for seeing to him." Grimgrin said. Connor pulls out a pair of bone dice from his pocket and finds a seat on the deck and begins to roll them. "Do be quick my lord!" he calls over to Ulrich. "It's my neck they want and with just Otto, me and the captain," he said inclining his head to Svlad, "we can be easily outnumbered and forced to set sail." "What exactly did the men you see the last time do?" "THey didnt attack you?"